The Indian government aims to attract dollar flows from non-resident citizens to support the rupee and has dropped the idea of a sovereign bond for now, two senior government officials familiar with the matter said on Monday. Some financial market participants had speculated the government would issue an overseas bond to raise foreign money to defend the rupee, which fell to a record low earlier this month, like it did during previous bouts of rupee volatility in 2000 and 1998. 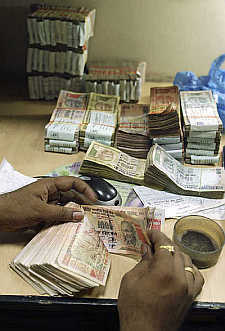 "All have agreed that it is not a time for India to issue sovereign bonds at this stage," said one of the officials. The central bank, the Reserve Bank of India, did not support issuing a sovereign bond either, he said. The rupee has steadied somewhat since the RBI took unprecedented steps last week to try to create demand for the currency by aggressively draining cash from money markets and sharply raising short-term interest rates .Traded at around 59.59 per dollar on Monday, it is about a per cent above its record low of 61.21 hit on July 8. Some of the rupee's 12 per cent fall since May reflects a broad sell-off in emerging markets on signs of a winding down of US stimulus. But there are also specific fears about India's slowing economy, lack of substantive reforms and its large current account deficit. Measures from the Indian stock market regulator aimed at curtailing speculative positions against the currency gave it some reprieve, but market participants are bracing for a rise in policy rates or other aggressive measures to attract foreign money. "We understand that we need funds to finance our current account deficit but we do not want to send any signal of panic outside India," a second official said. The government's first line of defence therefore would be to woo non-resident Indians, even possibly raising the yields on deposits for these non-residents, the sources said. The government sources said India could consider raising the policy repo rate if the rupee falls towards 61-62 to the dollar, citing recent meetings between the government and the RBI. The government is also considering attracting inflows by allowing select companies such as state-run India Infrastructure Finance or IDFC to raise up to $4 billion in debt abroad, they said. The 10-year benchmark 7.16 per cent, 2023 bond yield jumped 8 basis points to 8.08 per cent after the news, while the rupee barely reacted. Bloomberg Television subsequently quoted India's Chief Economic Adviser Raghuram Rajan as saying the government "has not dropped any options" for stabilising the rupee.